This contemporary dress of peau de soie features tiny decorative stitching with hand-sewed sequin-backed pearl beads. She carries a single stem flower. Angelique stands 12" in height. 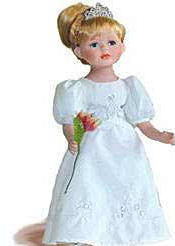 Size (inches): 7.95" X 4.09" X 16.14"
More Photographs - Angelique - Flower Girl - 12"
End of More Photographs - Angelique - Flower Girl - 12"